Tired of skincare products that don’t deliver results? Are you having dull skin, dark spots, uneven skin tone, and looking for a clinically proven product that works from inside out? The market is flooding with skin whitening creams, and many skin lighteners still carry chemicals and harmful bleaching ingredients that may damage our skin, and pose serious health risks if used for prolonged periods. Hence, care should be taken when choosing a whitening skincare product; be it oral or topical application. When using any skin whitening product, it is vital that you place your health first and read if there are any side effects of using it. To be safe, choose a plant-based beauty supplement such as Heliocare Purewhite Radiance Max 240 that offers vegetable-based capsules. What possibly could be more convenient to get your daily dose than just by popping these whitening pills? Not only are you able to attain the fairness you desire through their combination of the exclusive technology FERNBLOCK + WHITE TECH COMPLEX, there are also additional anti-ageing and photoprotection benefits that will aid in achieving a firmer, plumber and younger looking skin. Some years back, I was introduced to the 1st generation of Heliocare Purewhite Radiance: The All-In-One Pill. I am pleased to learn that there is an improved version – the Heliocare Purewhite Radiance Max 240, with an additional dose of Fernblock to boost skin radiance, fairness and anti-ageing. What is Heliocare Purewhite Radiance Max 240? Exclusively formulated with Fernblock® and White Tech Complex, the synergistic effect of both technologies ensures effective and efficient results with an enhanced UV protection to prevent hyperpigmentation. Recent study conducted in National Skin Centre, Singapore, 62% improvement in melasma was observed when compared to baseline in just 12 weeks. 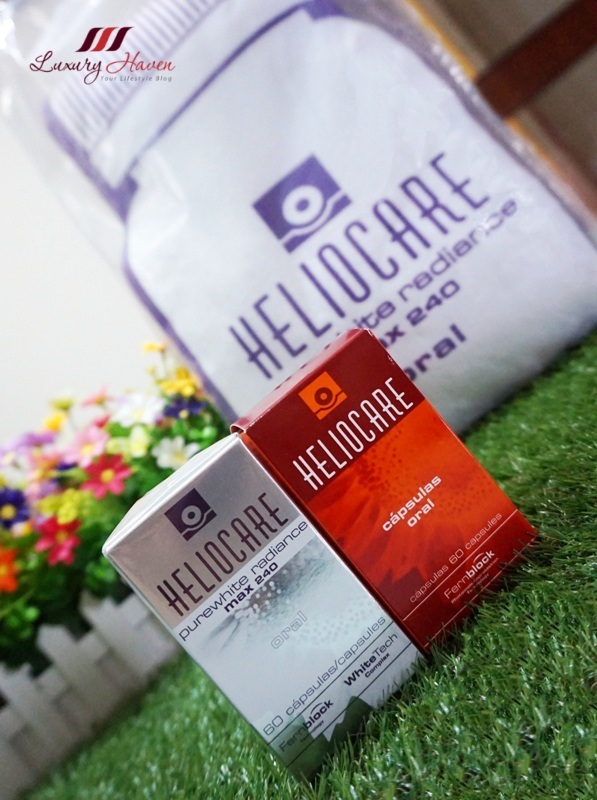 Heliocare Purewhite Radiance demonstrates improvement in skin moisturization, skin brightness, skin elasticity and reduces water loss through our skin. These parameters are associated with decrease of skin blotches ( whitening effect ) and wrinkles ( anti-ageing effect ). The study was clinically evaluated by dermatologists, confirming the visible effects of the product on skin blotches and wrinkles. Heliocare Purewhite Radiance is a safe and effective treatment that combines different technologies with strong scientific support. * Fernblock - 100% Herbal, Extract of Polypodium Leucotomos. The first oral agent that has shown abilities to quench free radicals and decrease the development of hyperpigmentation. * A whitening agent which intercepts the formation of melanin, L-Cystine reducing the production of dark pigments, and enhancing skin whitening. * Pomegranate extract, also known as Punica Granatum, has been extensively used in traditional medicines in many countries. According to the clinical study, when Pomegranate extract is administered orally, it can be used as an effective and safe whitening agent for the skin. * Vitamin C ( L-Ascorbic Acid ), a potent and effective antioxidant that interferes with melanin synthesis, this decreases the melanin concentration in the skin, leading to a whiter looking skin. It also neutralizes free radicals from environmental aggressors and prevents collagen damage. * A study showed that Vitamin B3 has the ability to reduce hyperpigmentation and increase skin lightness after 4 weeks of use. I believe with continue usage, I can see an even better result and certainly looking forward to lightening my pigmentation. Do you know that just 10 minutes of UV exposure may damage your skin? Living in a tropical country like Singapore makes it almost impossible to get away from the scorching sun. 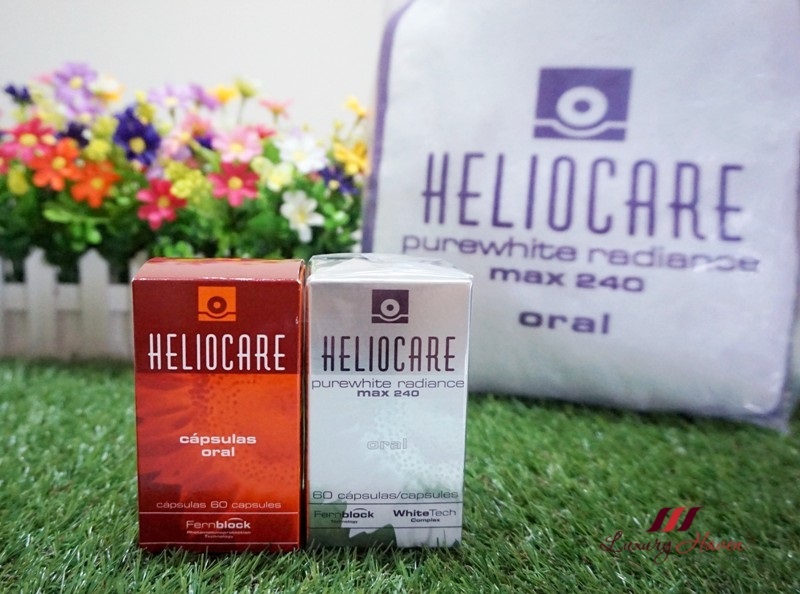 While Purewhite Radiance Max 240 is a daily supplement to be taken twice daily, promoting a more radiant and youthful looking skin, Heliocare Oral is the World’s First Oral Sunblock since 2001 and taken just 30 minutes before sun exposure. It has excellent antioxidant benefits, sun protection abilities and repair mechanisms for damaged cells caused by UV rays. Let’s fight the sun with this oral sun protectant! Clinically proven ability to prevent free radicals, premature ageing and hyperpigmentation caused by harmful UV rays! The supplement with Fernblock addresses limitations of topical sunscreen, providing protection to all skin areas and reaching the skin’s deepest layers. An ingredient that made sun protection possible, Fernblock® is an extract from Polypodium leucotomos, a fern originating from Central America that during its adaptation from life in water to life on land developed a natural mechanism to protect itself from sun radiation. These exclusive and original sun protection mechanisms have been patented and are the basis of Heliocare technology, the most advanced sun defence line with demonstrated effectiveness of topical and oral administration. Without adequate protection against the harmful UV rays, effects such as involuntary darkening, skin ageing and DNA damage can happen to anyone. 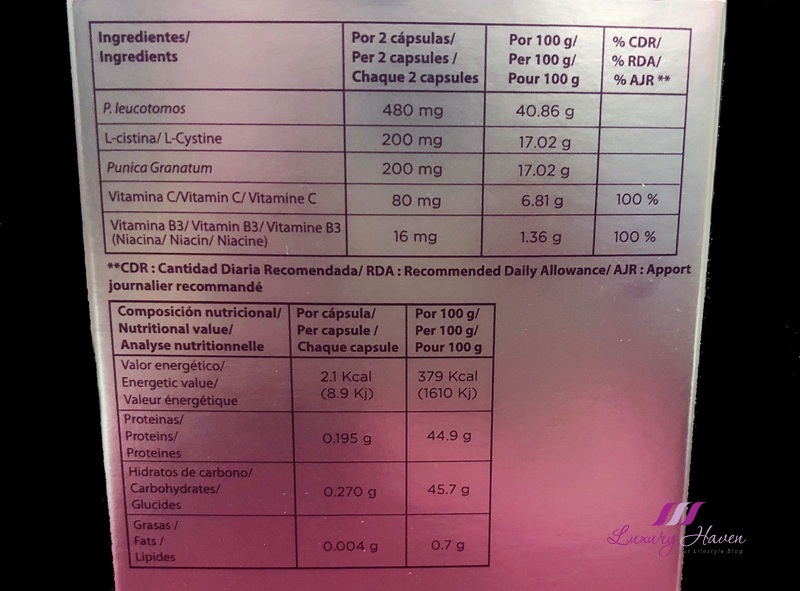 Exquisitely formulated with additional ingredients such as chemical / physical filters, photosomes, sunspheres, lutein, lycopene and vitamins to increase the level of protection against the UV rays, Heliocare Oral also repairs DNA damage and promotes positive skin health. It is 100% herbal with no chemical added. Widely recommended by Dermatologists, Doctors and Plastic Surgeons. Do I still have to consume Heliocare Oral after taking Purewhite Radiance? 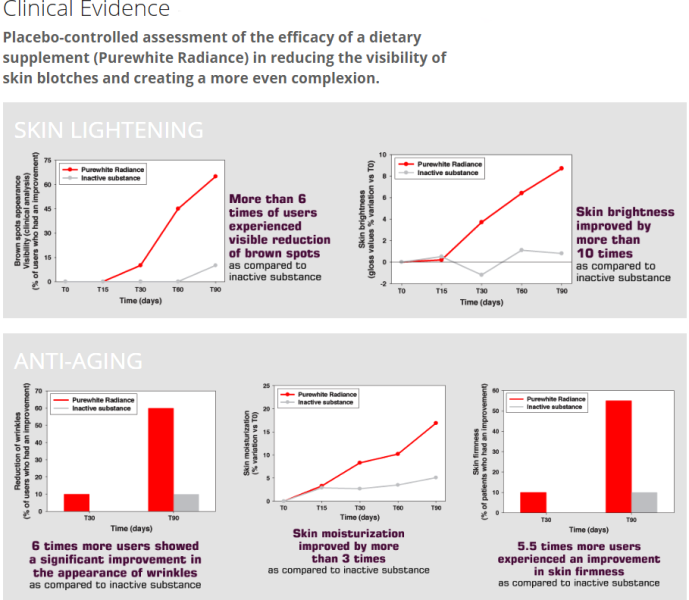 Yes, Purewhite Radiance is not a replacement for Heliocare Oral. 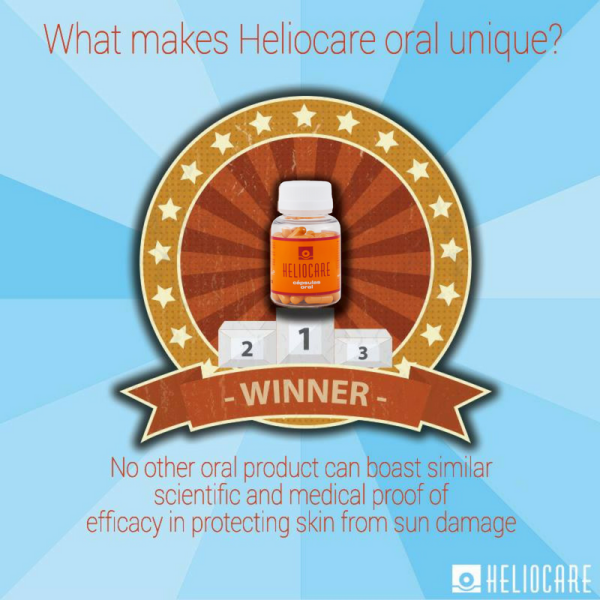 For sun protection, please take your regular dose of Heliocare Oral. With these two beauty supplements – Heliocare Purewhite Radiance Max 240 and Heliocare Oral, one that boosts skin radiance and slows down premature skin ageing through quenching of free radicals; and the other which protects the entire surface of your skin against harmful UV rays ~ it is a perfect marriage to support better skin health. Invest in a bottle of Heliocare Oral ( 60 capsules, SGD 58 ) and Heliocare Purewhite Radiance Max 240 ( 60 capsules, SGD 148 ) now, and your skin will thank you for it! Next, check out our travel tips on How to Prep Your Skin for Long-Haul Flight! Hop over to Purewhite Radiance Max 240 Anti-Ageing Supplements Giveaway! 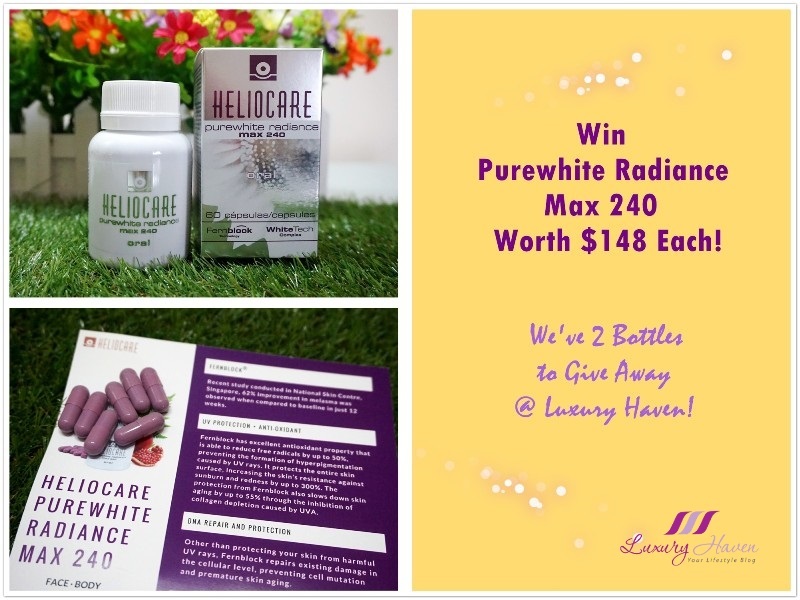 Be one of the two readers to Win Heliocare Purewhite Radiance Max 240 Worth SGD 148 each! how u compare heliocare purewhite radiance max 240 and crystal tomato? I've heard about Crystal Tomato too but I've yet to try...... Have you tried? No promotion with discount off for these products? Never tested these pills and the brand is really a dicovery for me. Thanks for te lovely review! How wonderful. I would prefer to swallow pills rather than put cream on my face. LOL! I had not heard yet of internal UV protection, completely new to me! I love this idea! I always seem to miss a spot when applying sunscreen, so an oral sunscreen is the perfect back up! These both sound like great beauty supplements! Sounds like an interesting product. Have a great week. Seems a very good and effective product! I've used these. My skin reacts to sunscreen so good to find an alternative. Great to know that heliocare have an improved version of whitening capsules. And it's really great to know heliocare offer health safe n result oriented products. A brand I am familiar with and I wouldn't really mind giving another go. Looks like its an effective product. Thanks for sharing the information for hello care sunscreen. Cheers to healthy and glory skin, both inside out! Having to ferry my kids around under the hot sun without having to reapply sunblock is a plus point for busy mum like me. Hope to lay my hand on this amazing products soon.